Start by sharing your ideas about your wedding with us. 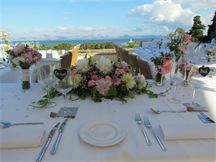 Then we work with you to find your ideal venue and bring together all the key elements to create your perfect day. Why should we ask someone to plan our wedding? It's been estimated that a bride spends more than 245 hours organising her wedding - that's the equivalent of six weeks working full time! And when you want to organise your wedding overseas, there are specific challenges. Your local knowledge may be limited and the language barrier can be daunting. We work with you, offering guidance and expertise to make the process steam-lined and hassle-free. How will your services affect our budget? We negotiate on your behalf in Spanish to get the best possible prices for you - and that can make all the difference to your budget! We can venues and options that you might not have considered. We save you time and stress, making it much easier for you to make decisions and enjoy your big day. Can we afford your wedding planner services? Yes you can! Before we start we ask you for an idea of your budget so that we can fit our suggestions within the budget to hand. Then we help you keep track of costs with regular updates. Some of the loveliest weddings we have organised have cost much less than what people usually spend on their weddings at home. 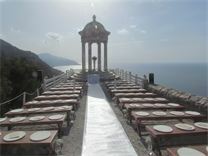 Some clients choose to have a smaller wedding for say 80 to 100 guests abroad rather than inviting 150 guests at home. This way they can have the wedding of their dreams AND save money. The process starts with a free consultation. WHY NOT CALL US on +34687934707? How will you be involved on the big day? We are there to co-ordinate everything, liaise with all your suppliers and take care of any last-minute issues. Leave the work to us and make sure that you have a wonderful experience to be cherished forever. Yes, absolutely! It's definitely a growing area for us. And our islands welcome thousands of gay visitors each year. With 14 million people visiting every year and an ever-growing number of five-star hotels and gourmet restaurants and venues the friendliness and service levels have never been as good as they are now. 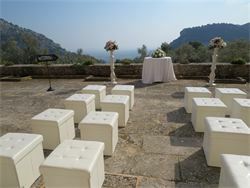 Mallorca, Ibiza, Formentera and Menorca are wonderful places to get married in - for everyone! Do you have special packages for people on a tight budget? 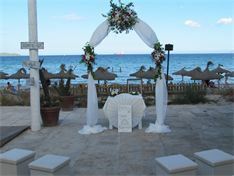 Yes, we have excellent inclusive wedding packages. We have selected a number of special venues which offer great value. 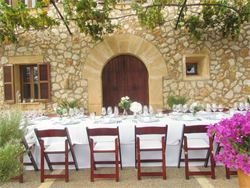 Our packages include everything from hair and make-up for the bride to wedding flowers, celebrant, cava and canape reception, full wedding meal with wines, wedding pergola or arch with flowers, photographer and cake. When we ask you to plan our wedding, what do your services include? 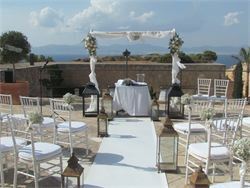 We help you find the ideal place for your ceremony and reception, whether that's a church, hotel, finca, or restaurant. We book the venues and liaise with the staff, caterers and other suppliers on all the details right up to your big day. We stay in contact with the vicar, priest or celebrant and making sure that he or she knows what your wishes are for your ceremony. 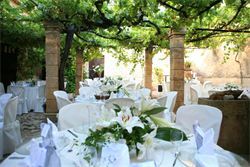 We negotiate great prices on your behalf, translate, provide you with all the information you need and make everything is co-ordinated to make your celebration a wonderful one. We are there on the day of your wedding to co-ordinate everything and make sure that all the details are in place. We keep in touch with you by email and phone all through the planning process until the big day (and often afterwards too on a friendly basis! ).